SENSOR FUNCTION-Fully automatic and completely touch-free operation,the non contact Intellisense can avoid Bacteria cross infection. MORE CONVENIENT-Easy to top filling, also can be hung on the wall. 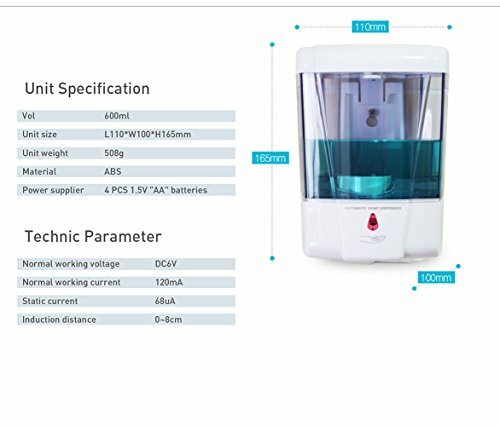 Single out the liquid 0.8~1ml,avoid unnecessary waste . 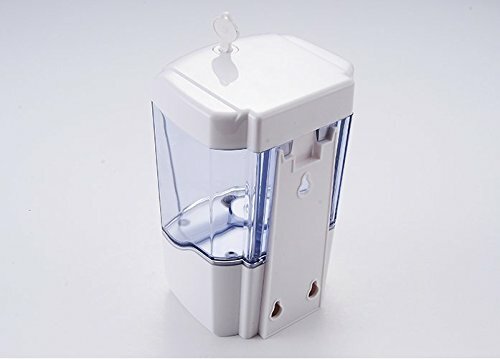 NON-DRIP AND MORE CLEAN-Innovative non-drip design eliminates waste and countertop mess,large easy to fill opening. 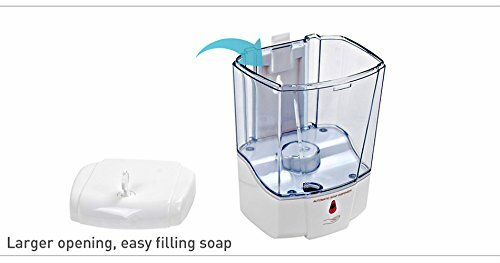 SUITABLE FOR-Liquid soap, body lotion, shampoo, cleaner and so on.This is a hands-free soap dispenser that works well as long as you do not use a too thick soap in it. It dispenses the soap each time and does not drip or leak. More place can use-Perfect to use at bathrooms, kitchens, office, school,airports, hospital, hotel and restaurant and other public places. MUCH FUN-You will find your children like it, and now they won't forget washing their hands, it's much more effective than mom's reminders. Hand washing is one of the most important things you and your children can do to help you stay healthy. 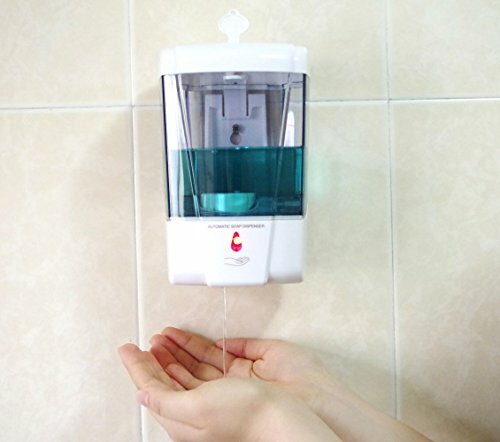 The no-touch automatic hand soap dispensor helps eliminate the millions of germs that your hands can pick up each day. 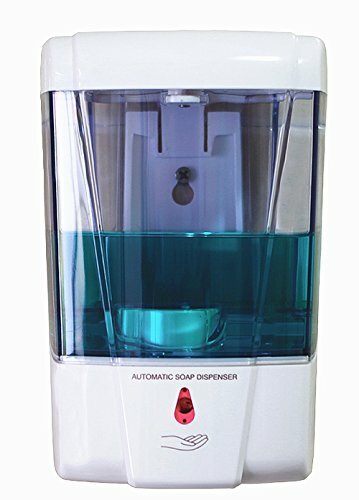 It automatically senses hands and dispenses just the right amount of soap. Save money by using any refill soap of your choice - works with liquid soap, shampoo, kitchen hand soap, foam soap and hand sanitizer. Easy to clean exterior - simply wipe the surface with a damp cloth. With a large capacity, refillable tank, you has a large capacity so it doesn't have to be refilled very often. 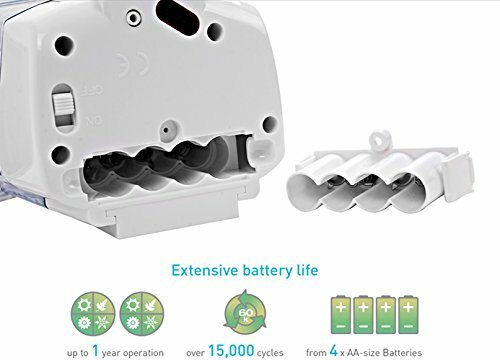 Easy to use, high quality, with no drips, you will not regret buying it. 1) Use the mounting plate as a template to mark the position. 2) Drill two 5mm holes and inset plugs into the holes. 3) fastten the mounting plate on the wall with the provided screws. 4) Slide the dispenser in the mounting plate. 5) Open the cover and fill in the liquid to the container. 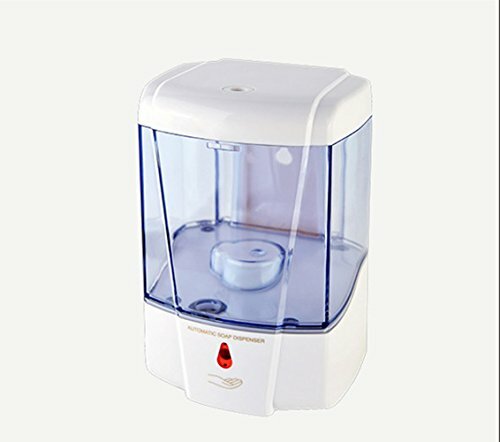 6) Put your hand under the sensor 0-10cm,and let the dispenser to start working for continuously until liquid soap come out from nozzle. 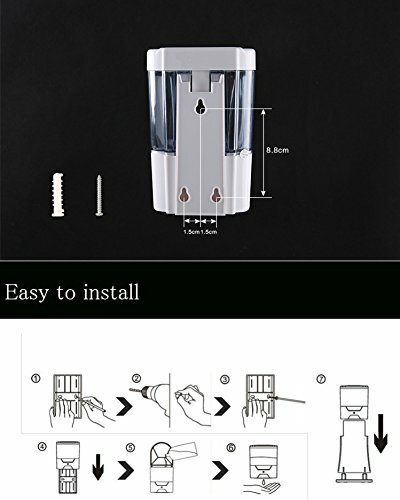 At the first use, since the liquid has not completely flows through the pipe, may not liquid at first, please try several times.